This is a distillation of my "design notes", with more practical details as I move along with the construction, and (in due course) some pictures. Right at the moment I'm using it as a kind of progress report for myself - it's a mixture of immediate plans and actual construction, so isn't too clearly structured! The signal control circuit is on 0.1" matrix board for the time being - after hours of trying to work out exactly what was going to go where on a PCB, I decided to start soldering everything together anyway to make a prototype. Right now the board is getting pretty crowded, and there isn't room for all the traces. For the moment I want to keep one or two options open, for instance the volume control and the layout of the balanced connections. At some point in the not-too distant future, though, I hope I'll be more or less satisfied with what I've got, and then I'll build a proper set of PCBs for the project, which will be a chance to tidy it all up, and of course add such niceties as a ground plane if I can. I use sealed relays with gold-plated silver contacts, type 53W/1 from Fujitsu, for all switching, including output polarity and mono/stereo selection. 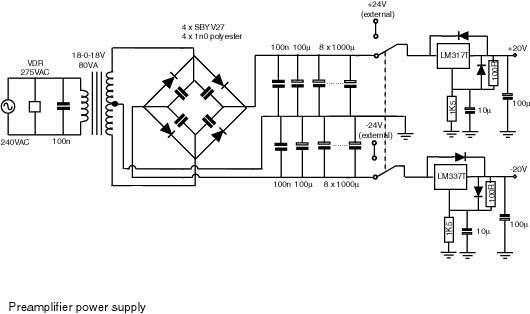 The 5V power supply for the relays is separately regulated from the ones for the TTL logic and the indicator LEDs to avoid glitches. All op-amps are Burr-Brown OPA2604, with one pair of LM317/337 regulators for each stereo channel. The gain of the output stage is +10dB, while the input buffers are unity gain except for the CD input (see below). 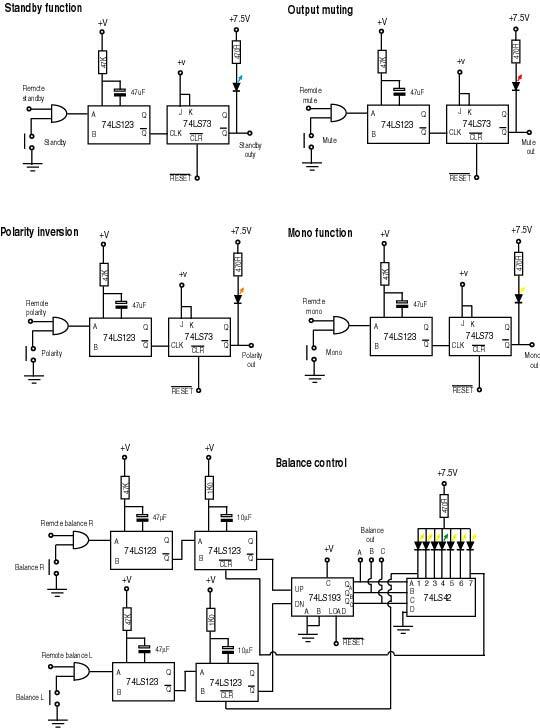 If an unbalanced input is selected, the balanced signal is generated by inverting the input before the volume control, so that antiphase signals are always present in the volume control and output stages - this ought to decrease hum and RF pickup and improve the power supply rejection ratio. The only drawback of this is that is means that if I wanted to use a mechanical potentiometer for the volume control, instead of the digital one currently installed, I would need either to find a quad ganged one, or to reconfigure the balanced output. There is a first-order low-pass filter at the inputs, with a pole at around 300kHz, to define the bandwidth of the amp, and to reduce the ingress of high frequency noise. I've had trouble with RF demodulation with one or two circuits before, and this filtering (together with the copper foil shielding inside the boxes) should help. 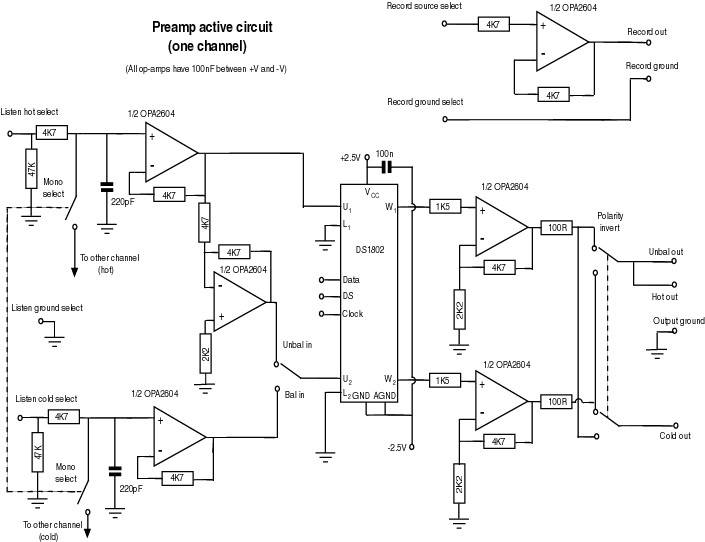 The digital volume control I use (see below) has a quoted 3dB bandwidth of 700kHz, so I wanted to keep the net bandwidth of the preamplifier within this too. I'm intending to build a couple of wide bandwidth power amps shortly to add to this system, and I want to minimise the risk of frying my tweeters. The matrix board isn't quite big enough for some of the control functions (the optoisolators, for instance), so these have been relocated to the digital board for the moment. After lengthy consideration - see my notes - I decided that the most logical and practical (though not necessarily the ideal in subjective terms!) solution for volume control was to use a digital potentiometer. As an initial trial, I settled on the Dallas Semiconductor DS1802 stereo digital potentiometer (partly because it allows push-button input as well as the serial connection, but mostly because Maplin stock it and it's cheap). I use one chip for each channel, and one channel of each chip handles each of the two polarities of the balanced signal outputs. The DS digital potentiometers aren't designed expressly for high-end audio, unlike the Crystal CS3310 (used by Jeff Rowland in their top Coherence preamp), which has dual voltage supplies and an internal op-amp. The specifications given on Dallas' datasheet are quite reasonable, however, (and in fact not too much worse than those for the CS3310! ), so I decided to give them all the help I could, and see how the chips sounded. I floated the power supply for the DS1802 to +-2.5V, and each chip has its own regulators (LM317 and LM337), fed by the 15V regulated supply for the op-amps, and the digital inputs are each isolated by low current opto-isolators to separate the ground for each channel from the other and from digital ground. There isn't going to be a lot going on in the digital circuits most of the time, since there is no microprocessor at the moment, but I want to do things properly right from the start (and, besides, the symmetrical power supply I used for the DS1802 rules out connecting digital ground to the signal ground anyway). The DS1802 has a maximum power supply voltage of +5V, so while distortion is low for a 1V RMS signal (quoted by DS in their evaluation report for the device as 0.002% at 1kHz and at -6dB, and less than 0.02% from 20Hz to 20kHz), one needs to be careful with input signal levels. 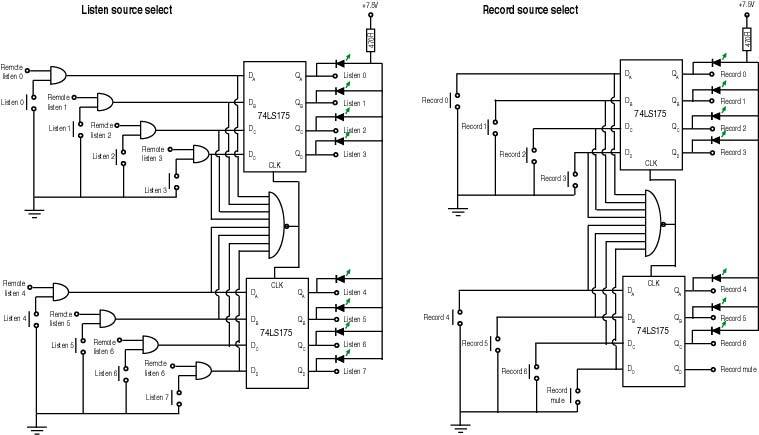 The CD standard output of 2V RMS corresponds to 5.6V PP, which is a bit large compared with the operating range of the DS1802, so I padded the CD inputs down by a factor of 2 (6dB) to prevent overload and to give more comparable level to the other sources. With the 10dB gain in the output stages, a 2.5V peak signal at zero attenuation is now actually half way to clipping the output amplifiers. Given that Dallas' plots of intermodulation distortion against amplitude don't show a huge rise in distortion at 2V RMS or higher (not that I quite understand why), I don't expect the 5V power supply on the chip to be a serious problem. I note that the CS3310, which is used in some serious high-end preamps, has a maximum supply voltage of +-5V, which is only 6dB better than that of the Dallas chip. Although the solid state volume control has its advantages, particularly its compactness and low price, its limited dynamic range may all the same ultimately be a limiting factor in performance. 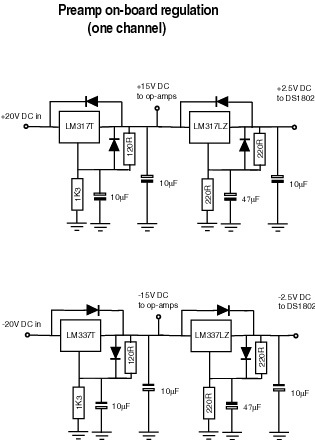 It has occurred to me that there are ways to keep a balanced topology with a relay system without doubling up the number of relays (and hence the cost), so I may in the long run abandon the DS1802 and go for relay switching for the volume control after all. I've been thinking about ways to get 1dB steps with a 64dB range, and this may be possible without much compromise. The other alternative is to use a more appropriate digital potentiometer chip - for example, the AD7376 from Analog Devices (which awkwardly has the digital code inverted relative to that of the DS chip), or the Crystal CS3310 that Jeff Rowland use. The volume control knob hides an optical rotation detector which decodes the sense and speed of rotation of the shaft using a two-bit quadrature detector. Thanks to Dominic Peterson for the idea, which to my knowledge hasn't been used in any commercial audio equipment (though Dominic points out that most computer mice work with optical rotation decoders!). The rotation sensor (or of course the volume control signal from the remote control) feeds an up/down counter, giving 64 attenuation settings. The current setting is displayed on a ring of thirty-three 3mm LEDs around the volume control knob, with intermediate codes shown by each of the adjacent LEDs being lit at half level. The six-bit attenuation code is adjusted for channel balance (see below) and then fed via a serial encoder circuit to the DS1802. The volume control system, with its combinations of parallel and serial connections and of digital and analogue circuits (not to mention the bad-hair-day web of wires and the mass of diodes and LEDs in the display), was a champion pig to build. I'd got everything working except the attenuator chip within a few weeks of starting, but getting the digital circuitry to talk to the DS1802 is taking an eternity - including several infuriating episodes of having to locate and fix loose connections on the digital board. This contains the mains switching, the +-20V and 5V power supplies and some digital logic (mostly for volume and balance control). This is the most urgent candidate for rebuilding as a PCB, since it is a veritable rat's nest of wiring (see previous paragraph). I don't have any facilities for programming PICs, so all the function control is done with (prehistoric) LS TTL circuits, which do unfortunately take up a fair amount of board space. They have the advantage however of being easy to debug, as well as having no high-frequency emissions. 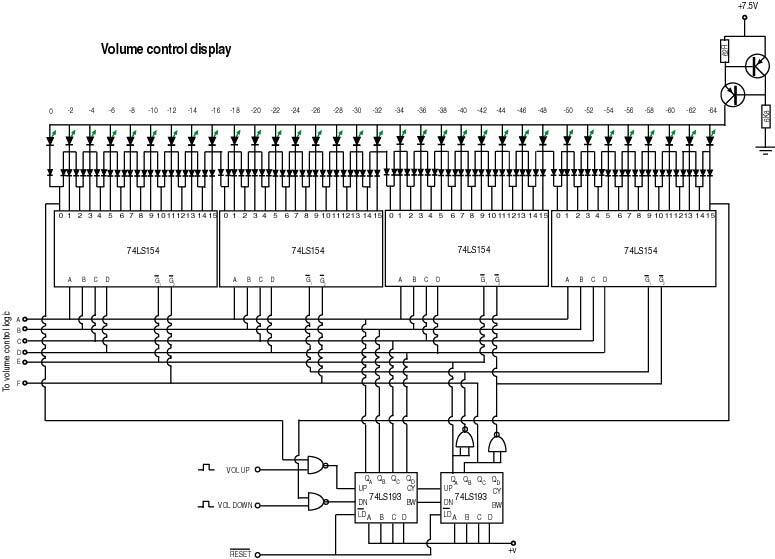 This at present consists of two boards: one for the volume control display , and the other for all the source selection and the rest of the controls. I split them partly because the matrix board wasn't long enough for the entire panel, but also because I didn't want to have to slot the 33 LEDs for the volume indicator through the front panel holes at the same time as the 27 LEDs for the other controls (or back out again in the case of a fault!). There is also a small matrix board mounted on the main front panel board containing the remote control receiver and decoder with up to 32 data outputs, although not all of these are used. The preamp is housed in a box constructed from 1.5mm aluminium sheet painted black, with gloss painted MDF end cheeks, to match the rest of my electronics (I used 3mm sheet for the power amp for extra robustness). The top and bottom plates have a layer of automotive damping sheet attached to them which, along with the MDF end cheeks, should suppress vibration of the enclosure. I'm not totally convinced that microphony is a major source of coloration in solid state amplifier circuits, though I did notice it in an RIAA stage where tapping a couple of polystyrene capacitors produced audible thumps through the speakers. The signal handling board has its own sub-enclosure, made of 0.5mm copper sheet, and electrically isolated from the chassis earth, but wired to the signal earth via the grounding post on the back panel. This should help to reduce the effects of RF pollution on the signal. If nearby mobile phones can make my passive preamplifier and valve power amp emit loud beeps, I can see that solid state circuitry will need all the help it can get! The signal board is also slightly decoupled mechanically from the chassis by mounting it to the latter through rubber grommets. The decoupling is probably not important (I haven't estimated the resonant frequency, and it's probably seriously overdamped anyway), but it's cheap and seems to be good practice. The front panel is a piece of 3mm aluminium attached with 10mm spacers to the front of the main chassis. The controls are all installed on the latter, making for better mechanical integrity and robustness. This also makes it easier to get all of the boxes together and then later set about finishing all the front panels at once. I agonised for quite a while over what kind of switches I should use for source selection and the other front panel controls. The main criteria were cost, aesthetics and compatibility with remote control operation - the latter consideration meant that I wanted to avoid normal rotary switches, since they left the chosen setting permanently selected. I like the look of the toggle switches that Audio Research use, with their long flat blades, but I couldn't find anything with momentary switching action that looked like these. Electromail sell some high-quality flat toggles, but these are expensive and the toggles are shorter than I'd like (given that the switches are to be attached to the chassis, a centimetre behind the front panel). It finally occurred to me that I could get cheap momentary-action push switches to do the job and look smart at the same time by using them with a home-made actuator button cut and milled from aluminium rod, then epoxied to the existing switch button. All the signal switching is done by relays, so the switches on the front panel don't need to be particularly exotic - I found some in Maplin for forty pence each. All the signal selection apart from the volume control (a large rotary knob) is now carried out by push buttons, and this gives a simple and modern look. The contrast between the plain aluminium controls and the black fascia (once I've had them anodised) should make it look a little like a (very expensive) Mark Levinson preamplifier. After long consideration I settled on a couple of push buttons for balance control, to match most of the other controls, with a row of seven LEDs above them to display the setting. The balance control sends a four-bit signal to the volume control, giving seven values each side of the centre setting. I haven't decided whether to make the balance increment 1dB or 2dB (or more) - I'll have to experiment with this. Eventually I intend to use a pair of EPROMS to map between the volume setting, the balance signal and the volume code supplied to the attenuator for each channel. Right now I haven't got access to EPROM programming facilities so I'm using a pair of 28-pin DIL sockets with wire links between volume input and output (in other words, the balance control has been disabled for the moment). The power supplies for the analogue circuits and for the digital circuits are totally isolated from one another, with separate mains transformers. The whole preamp is dual mono, with separate power supplies and a a single connection between each channel earth and mains earth in the preamp (and nowhere else in the system, apart from the odd source component). This isn't primarily to reduce crosstalk (stereo separation is probably enough already), but because I have a gut feeling that control of the signal grounding is essential for low noise performance, and this is near impossible if the two channels are joined at more than one point. For the time being, I intend to keep the analogue power supply circuit pretty much as it is now - a dual mono double regulated mains supply, with a pair of 18V, 80VA transformers feeding 7,000uF of reservoir capacitors (paralleled 1,000uF 50V SMPS electrolytics), and an initial LM317/337 regulation stage to 20V DC. The PSU for the control electronics is pretty straightforward, with a pair of 8V, 1A unregulated supplies. These feed four 7805 regulators on the various boards, as well as current sources for the LED displays. I have allowed for upgrades by adding a pair of sockets for DC input, and a switch to allow a choice between the internal PSU and an external one (which could be either mains powered or a battery). These are selected by relays (on the DC supplies as well as on the mains input) which are normally closed, but controlled by an additional external 5V DC source. The remote control is based on an article in Everyday Electronics, December 1992. It uses chips that are now obsolete, I'm afraid, but I had already built the transmitter and receiver a few years ago, and since they were working fine I simply transplanted the receiver to this project. I started off with a working (but in aesthetic terms, no more than functional) remote with a 12-key pad, matrix board and PP3 battery all bolted to a piece of 6mm MDF. I wanted to harmonise the style of the remote with the rest of the system (and, hopefully, to make people want to pick it up, rather than hide it out of sight! ), so I plan to build a new case out of 1mm aluminum sheet and MDF, with discrete push switches in a similar style to the ones on the fascia of the preamp. Almost all the functions on the front of the preamp are also controllable via the remote, as well as four unassigned "function" keys. The exception is the record source selection, which I thought was a bit risky (never mind pointless) to include on the remote, and saves seven keys too.